I think that.. as many Tea Partiers espouse.. a governmental revolution is needed again.. yet.. as Kafka indicates.. another bureaucracy would probably arise. Just think of the GOP's 1994 Contract with America and how, in less than a decade, Republicans became spendaholics far removed from those folks elected in 1994. I think that this hits to the heart of the issue. A sense of hopelessness results when the system becomes bigger that the people who work in it. I feel that it is the way that many people view the government. And sadly many other entities, both secular and religious, reflect this sentiment of bureaucracy and pygmies. This quote speaks to the sickness involved when the focus is taken off the objectives. I think that this might be the case in Haiti. Perhaps bureaucratic organizations have taken their eye off the suffering people of Haiti. Lets hope that, at least in this case, ways are found to bypass bureaucratic red tape and get aid to Haitians. 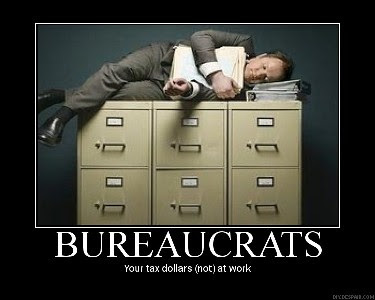 Ever been part of an effective bureaucracy? Or caught up in bureaucratic red tape? Solomon told us there was nothing new under the sun. A new "revolution" will only be as unbiblical as the first one was and won't produce anything new. If we see anything by the degredation of government leaders through the years we are going from good to bad. We are to pray for governmenal officials, recognize that they are put in place by God as He sees fit, and we are to submit (unless it violates biblical standars - not political, personal, societal, or even common sense). As the church degenerates (local-not universal) and marries the world, mores degenerate - the times we are living in Paul told Timothy will grow worse and worse, with evil "seemingly" triumphanying over good. The only time these issues will ever be set straight will be in a theocracy. We need to vote, hold politicaians accountable. When the American people determine that political parties and platforms were more imporant than character (Bill Clinton, etc) we were doomed. If the highest character is expected from elected officials then no revolution will change anything. We cannot change this entitlement, ego-centric, give me give socialistic government. We can not have our cake and eat it too, we can't have socialistic welfare, handouts, and entitlement and have responsible, fiscal, intelligent, and even moral government. We are a nation to has sucumbed to sybolism over substance. I wish we could stave off II Timothy 3 but God said it would happen. I will vote, I will pray for government officials, and I am waiting for the return of my Lord to establish His kingdom where He will rule with a rod of Iron. By the way, does your comment mean you will become Missouri Bob instead of Kansas Bob? @Gregg - I think that the problems of bureaucracy are also running rampant in churches and corporations. Even in smaller churches there seems to be a preoccupation with procedures. It is a problem that seems to bigger than just government.